It's all alone but the 12z fv3 is a thing of beauty. 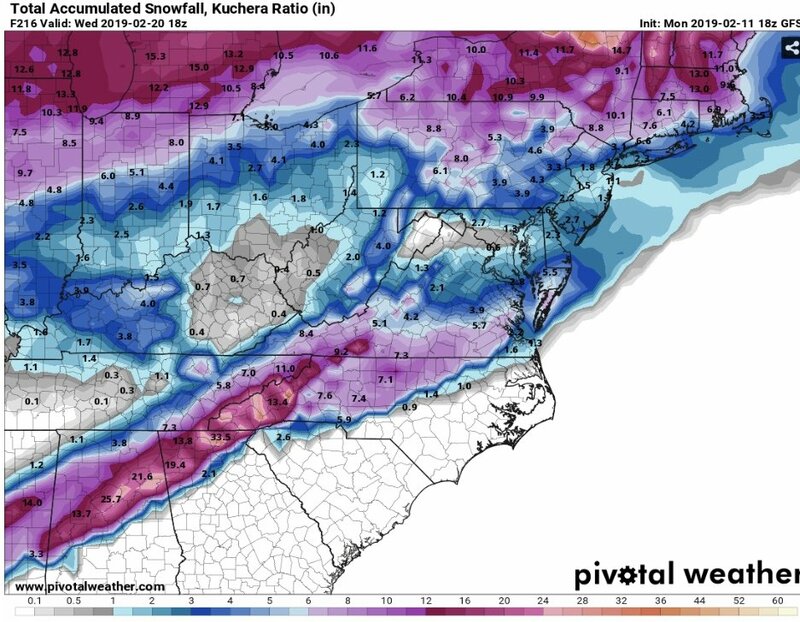 Massive storm for the mountains. Thank gosh. Im tired of this warm weather already lol. Mping reports showing ice occurring in Austin, TX. A lot of times with these overrunning events I like to look downstream to see how moist the atmosphere is compared to what models showed. Looking back at yesterdays 3km NAM runs, there was no real switch to snow for parts of TX, but on the most recent 6z run, there is a swath of 1"-2" across central TX. With dew points low enough, I think we could see wetbulbing at 850mb and some snowflakes/ip mixing in tonight and into tomorrow as this overrunning precipitation makes it into WNC. Similar setup on Sunday am but wedge does appear to recede. Could be some surprises in store this weekend..
Moisture didn’t quite make it into WNC, but saw some reports of sleet down around GSP.. tomorrow’s precip looks to be later and warmer as well on most recent Nam runs. Is it too much to ask for for two solid weeks off Gulf Lows and favorable blocking? Maybe the last half of Feb will bring the goods. 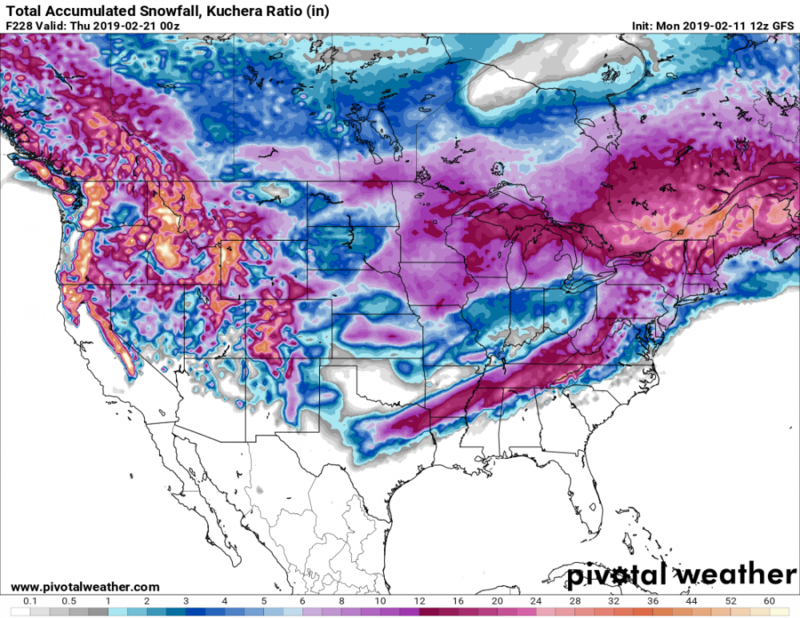 I am at the point of finding my favorite EPS member with long range fantasy snow and just watching it unfold to remember what a snowstorm looks like on models. You sure won't find it on the GFS. Spring is the word. Yes Timmy, winter blocking does (or did) exist. Location:Lake Toxaway, NC Elev. 3,000 ft.
33 and rain here. My FAVORITE kind of weather ! I like seeing the GFS and v3 on board w/ a storm 7-8 days out. Hopefully it sticks. Would love to have 1 more good snow before Spring! Who would have thunk this.......... in February. Grandfather Mountain set a new wind record about 4am this morning of 121.3mph. Crazy. It was the strongest wind I've seen at the house in foscoe since I moved there. Back from a little winter hiatus and it doesn't look like much has changed except my skin color. Hillbilly white to Valentines Day red in 10 days. But it was nice to get away for a while. Thanks to you guys for not letting me miss out on a good snow. Maybe a flake or two next week? You know property taxes are getting out of hand when Bob has to work at Ingles to pay them. 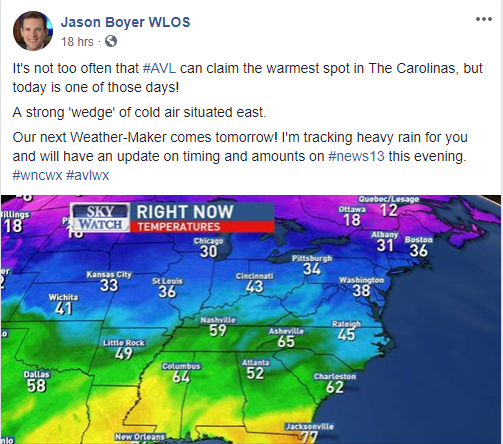 KAVL won't see below freezing temps for the rest of February! Crazy! What a strange Winter. Normally if you told me that in mid-February my snow total for the season thus far would be 10 inches more that what Boston, MA has received, I would would say we're having a heck of a Winter. Not this year. Oh well, let's get ready for another 7 days or so of not needed rain. Yep but then expect the typical below freezing temps in April to put a hurt'n on all the trees and flowers. No. Its virtually over at this point. Last February was awful too...and then March was the snowiest month of the season for me. I wouldn't say it's over for the high country yet. Yeah we are far from over. This winter has been awful though but as some have mentioned this spring is probably going to be delayed.